Based on a survey conducted by FC Business Intelligence in July with 125 credit risk professionals, 71% believe that their spending on analytics will increase in the next 12 months and 72% feel that following this spend there will be constant changes to their analytics platform moving forward. With huge amounts of investment in analytics software and expertise flooding in to the financial services credit risk industry, it is integral to understand the various strategic tools and strategies to employ moving in to 2015. 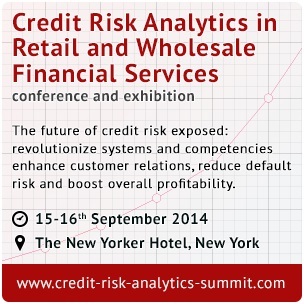 Already Bank of Montreal, BNY Mellon, Citigroup, Fifth Third Bank, GM Financial, ICICI Bank, JP Morgan Chase, Keybank, M&T Bank, Old Florida National Bank, RBS Citizens, Sterling National Bank, Suntrust, TD Bank, Toyota Financial Services, USAA, and Wells Fargo are signed up to attend the two-day Credit Risk Analytics Summit. Credit risk and analytics professionals from companies spanning across the financial services market (banks, credit unions, and alternative lenders) are coming together to discuss this market transition towards the application of ‘Big Data’ and analytics in today’s increasingly modern financial services world. With more than 10 C-Level speakers (Chief Financial Officer, Chief Risk Officer, Chief Credit Officer, Chief Compliance Officer, Chief Information Officer, Chief Marketing Officer, Chief Operating Officer, and Chief Data Officer) the event is bringing some of the most senior level decision makers from financial services organizations in North America. Randy Banner a Credit Risk Director at Ally Financial – an attendee at the event – commented “This event is shaping up to be the best of its kind in 2014 with the who’s who line up of speakers and attendees, and an agenda that addresses the full spectrum of issues pertaining to credit risk analytics”. FC Business Intelligence interviewed some of the Credit Risk Analytics Summit conference speakers about their views on hottest topics to be addressed onsite at this year’s event. Bruce Brenkus, Chief Risk Officer of Kabbage felt “the continued ‘Big Data’ evolution and balancing with regulatory compliance guidelines” were the most important topic areas to be discussed; whereas, Dave LaGasse, Head of Decision Analytics and Data Strategy at Capital One thought that we should really consider “what we as an industry should do, and should not do, to leverage new tools and technology to improve banking for the good of customers”. Conference sponsors are also queuing-up to showcase their data and analytics solutions at this high-level financial services meeting point. TIBCO Spotfire are Platinum Sponsors of the event and are also hosting an exclusive webinar. Gold sponsors include Dell / StatSoft, who are hosting a conference workshop; and KPMG, who are partnering with FC Business Intelligence on an industry white paper. CIRRO are also participating as silver sponsors of the event. The last chance discount – saving you $100 off of currently listed prices – expires August 22nd! Register now to save.